On Sunday 24 April 2016, history will be made as the one-millionth London Marathon finisher crosses the world famous Finish Line on The Mall. Karen Robb (40), from Markinch, will compete in the world-renowned event, raising much-needed funds for Alzheimer Scotland in the process. 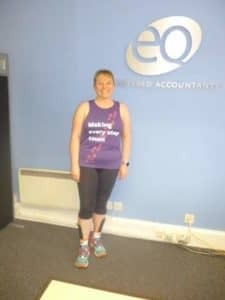 Karen, who works with EQ Accountants in Cupar, only started training six months ago but, with her last, long run now in the bag, is confident of completing the 26.2 mile course. To donate to Karen’s fundraising campaign, please visit http://uk.virginmoneygiving.com/KarenRobb .